Haven’t decided on a hotel yet? 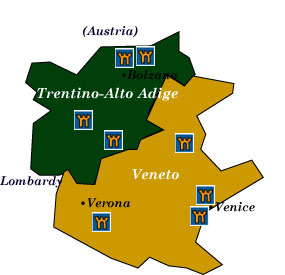 You can look at other available hotels in the regions of Trentino-Alto Adige and Veneto with Booking.com. Trentino-Alto Adige are two provinces with distinctly different traditions. Alto Adige (Süd Tirol) was once part of the Tyrol province of Austria until ceded to Italy in 1918. The atmosphere here is still German, while Trentino’s roots lie steadfastly in Italy. The broad swath of the magnificent Dolomites cuts across the region. About 100 castles exist in these mountains, as well as 140 residences of noble origin, and several fortified convents. Mostly dating from the 12-13th centuries, the defensive castles stood at strategic points on the mountain sides, while those on the valley floors were princely residences. Descend from the mountains and Veneto offers the Italy of dreams. Dominated by one of the world’s greatest maritime city republics, the region offers few castles to explore. Interestingly, the Venetian government forbade its noble families from building castles. Instead, they turned to erecting luxurious villas, of which thousands dot the Veneto countryside. Trent Charming and fashionable, this historical alpine university town hosts a Romanesque cathedral (Duomo); the crenellated Palazzo Pretorio, fortified residence of Trent’s medieval prime bishops; and the 13th-century Castello del Buonconsiglio. The Dolomites These spectacular mountains are home to some of Italy’s best walking trails, climbing, and skiing. Cortina d’Ampezzo is its most glamorous and famous resort. Bolzano Come here to visit Europe’s most famous ancient resident, the 5300-year-old mummy, Ötzi, who was discovered by hikers between Italy and Austria in 1991. His final resting place is now the Archaeological Museum of Alto Adige (Museo Archeologico dell’Alto Adige). Parco Nazionale dello Stelvio has wonderful walking trails, glaciers with year-round skiing, and enchanting Alpine valleys. Val Gardena and Val Badia Known primarily as a premier ski destination, in these valleys you’ll also find one of the last areas where Ladin—an ancient Latin-based language is still spoken. Ladin is taught in area schools and its culture is protected by law. The Museo Ladin is housed inside the 12th-century Tor Castle. Merano The former capital of the Austrian region of Tyrol, this spa town attracts the well-heeled who flock here for the thermal waters, mild climate, and breathtaking scenery. Venice Who really needs a good reason to come here? Its unique palette of colors that washes over its landmarks, 150 canals, 409 bridges, and innumerable palaces transcends the sublime. The Basilica di San Marco combines Byzantine and Romanesque styles in a opulent whole. The Byzantine mosaics and rare marbles in the interior are dazzling. The Doges’ Palace (Palazzo Ducale), symbol of Venice’s wealth and power, should be high on any traveler’s list to visit. The Grand Canal ranks as one of the great urban passageways in the world. Founded by Napoleon, the Academy Gallery (Gallerie dell’Accademia) houses a phenomenal collection of the Venetian art of Bellini, Carpaccio, and Giorgione. Modern art lovers should head over to the brilliant Peggy Guggenheim Collection (Collezione Peggy Guggenheim). The Villas of the Veneto Many of the aristocratic villas built throughout the Veneto are open to the public. One of the most interesting ones is the Villa Pisani in Stra, which was once the palatial home of a Venetian doge and of Napoleon during his Italian sojourn. A cruise between Venice and Padua on the Brenta Canal (also known as the Riviera del Brenta) passes by several of these fabulous summer residences. Padua (Padova) This former religious, cultural, and artistic center is home to Italy’s second oldest university (Galileo taught here and Copernicus was a student). Its medieval center and charming arcaded streets are well worth a visit. Don’t miss Giotto’s 38 frescoes painted between 1304 and 1306 in the Scrovegni Chapel (Cappella degli Scrovegni). Vicenza This proud and noble city once boasted 100 palaces. Many of these palaces were embellished by Renaissance architect Palladio, whose work influenced styles in England and America. Verona With cypress-covered hills in the distance, the old town of Verona sits enclosed in 16th-century fortifications. Two sights worthy of a visit are the Castelvecchio, which was the former seat of Verona’s powerful Della Scala family and is now an art museum, and the Casa di Giulietta—Juliet’s House. She may be fictional, but Shakespeare’s most tragic heroine endures for the visitor to Italy.